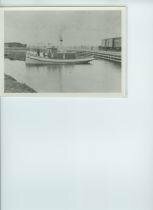 1868, Mar Towed scows from Fond du Lac, WI. Reported first tug used in Duluth-Superior harbor. 1869, Nov Damaged by ice on Lake Superior. 1876, May Sunk off mouth of Ontonagon, MI, Lake Superior. Owned John Flynn, Duluth, MN. Winter of 1883-84 Received new house at Duluth. 1884 Bottom recaulked, Duluth; 3 net tons. 1885, Jul Chartered by unknown elevator company. 1886, Aug 25 Laid up at Duluth. 1888, Aug 5 Leakage or accidental opening caused her to sink at St. Paul & Duluth dock, Duluth, Lake Superior; wreck raised by NAPOLEON GRIGNON. 1892 Towed logs on St. Louis River. 1892, Feb 19 Rebuilt & received new boiler; 150#. 1892, Oct 2 Burned at dock, Duluth, Lake Superior. Later rebuilt as JOHN H. JEFFERY JR.; US77021.